Softcover / signed by the author. 433 pages with 30 illustrations. Ideal for ages 10 and up. OUT OF BREATH and hands trembling, Ophelia opened the velvet pouch and slid out the bottom half of a feather, one that was a dark olive with hints of bright green and aquamarine. Right away she noticed a resemblance to the one in the white linen. Ophelia joined them together. Her heart almost stopped when she discovered that they matched perfectly. It was clear to her that she must go with Q to the Land of Cain---in the beyond, a place with jummy bugs, gruntles, a water nymph and The Messenger. So begins the thrilling journey that will take Ophelia from her uneventful life in the fortressed village of Paipalon into a land filled with peculiar creatures, like Gat, Mosstoe, and the brothers Kimber and Van. While trying to make it to the village of Charleroi to meet The Messenger, Ophelia will be thrown off course by a murker known as Mother Growler. In an attempt to thwart the murker's evil plan, Ophelia learns a few valuable lessons, one of which saves the lives of those she has come to love. Please include signing instructions in your PayPal shopping cart. 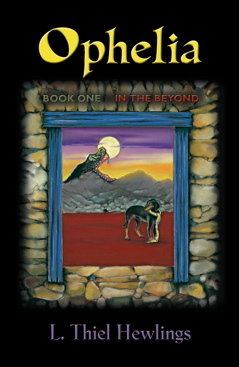 Unsigned books are also available at Booklocker.com, Amazon.com, Barnes & Noble, and other retail bookstores.